I’m a DACA recipient and I’m currently completing my application. I’m not sure about the residency part of the application and what option I should pick. If you received a Social Security Number (SSN) through Deferred Action for Childhood Arrivals (DACA,) use it for this section. If you have no SSN but have a valid Individual Taxpayer Identification Number (ITIN) you may use that for this section. In the Citizenship section of the application, choose “Other” from the drop-down menu and click the box labeled “No documents.” Remember, this information is kept private and will only be shared with District colleges and the State Chancellor’s Office. I have not yet received my application confirmation. Please send an email to reset@peralta.edu if it has been longer than 48 hours. Include your First Name, Last Name, Date of Application, Seven-digit OpenCCC/CCCApply Confirmation #, and Student ID (if you have one). I am having problems logging in and was told to clear my browser cache. How do I clear my cache? Close the about:preferences Any changes you’ve made will automatically be saved. Completely exit Internet Explorer by closing all browser windows. Open a new instance of Internet Explorer. Select Tools > Internet Options; verify you are viewing the General tab. Click the Delete Cookies button; click OK on the dialog box that pops up. Click the Delete Files button; select the Delete all offline content checkbox; click OK.
Click the Clear History button; click Yes on the dialog box that pops up. Close the instance of Internet Explorer. Open a new instance of Internet Explorer and try to log in again. If you are still having problems logging in, reboot your computer and try logging in again. I have tried to log in but my Student Login or password is not working. What do I do? Remember passwords are case sensitive; make sure your caps lock key is not on. Your student login is same as student ID. If you forgot your password, please see Question 8 on this page for instructions on how to retrieve your PASSPORT password. Retrieve your password by email if you have set up your Security Question and Answer. Retrieve your User ID and initial Password if you have NOT been set up your Security Question and Answer. To reset your password, submit your username or your email address to reset@peralta.edu. If we can find you in the database, an email will be sent to your email address, with instructions how to get access again. How do students use a permission number? 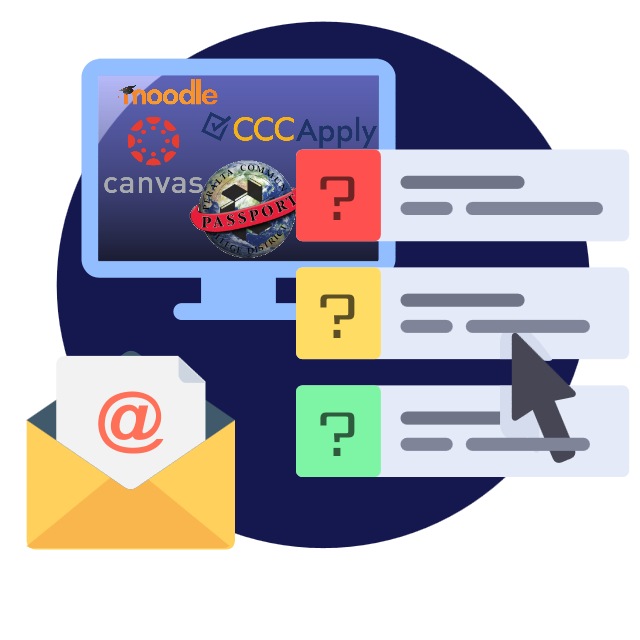 Before the first day of classes, a nightly process runs to automatically enroll students from the WaitList. After classes begin, the class will remain closed and you will need to attend the first class meeting to get a permission number or a signed add form from the instructor. If the instructor provides you with a permission number, go to your Student Center and add the class using the permission number. Make sure to drop yourself from the waitlist before adding the class with the permission number. Dropping a class using the Student Center. If the instructor signs an Add form in place of a permission number, take the Add form to the Admissions and Records Office on Campus. Please go to Adding-a-closed-class-with-a-Permission-number for instructions on how to add a class using a permission number. There is only one person on the waitlist so if you just show up to class the first you would most likely have a pretty good chance of getting in. The instructor would give you a permission number and then you could enroll in the class. Waitlists close once classes begin so you cannot get on the waitlist at this point. A “waitlisted” student must first drop themselves from the waitlist and then, use the permission number to enroll in the class. Remember, the class will remain closed and the permission number will override the ‘closed’ class status in order to allow the enrollment. How do students “automatically” enroll in a class from the waitlist? There is a daily automated process that moves students from the waitlists into a class if a space becomes available. Students are notified by email when they are enrolled through this automated waitlist process in PeopleSoft. The auto-enroll process from the waitlist stops a day before the first day of the term (i.e., Sunday, August 20, 2017). A full class will remain closed as long as there are students in the waitlist. I have completed the enrollment services and still have the enrollment hold. How do I clear the hold? If you have completed assessment, orientation and counseling services and there is still a hold on your account then you need to contact the counseling office where you completed the services. I’m planning to take requires prerequisites. How do I clear prerequisites? If the class you are planning to take requires prerequisites, please contact/visit the academic counselor on campus so that they can provide you with information on how to clear the prerequisites. Please go to Dropping-a-Class-using-the-Student-Center for instructions on how to drop a class using the student center. Please go to Adding-a-Class-using-the-Student-Center for instructions on how to add a class using the student center. How do I submit official transcripts from other institutions? You should submit official transcripts from all Colleges and Universities previously attended. Opened, faxed or emailed copies of official transcripts will not be considered official. Official transcripts from other institutions become the property of the Peralta Colleges and will not be duplicated or returned. Official transcripts from other institutions will be retained at the District Admissions and Records Office for a maximum of five (5) years from the date the office received your transcript. Transcripts are not automatically evaluated for a student’s educational goal. Please visit/contact the counseling office on campus for more information. Transcripts from other institutions can be submitted to our District electronically, by mail or in person. How can I access my Unofficial Transcript? Your unofficial transcript is available on your PASSPORT Student Center. For instructions, you may go to How to view your unofficial transcript using the PASSPORT Student Center. You may also request your unofficial transcript in-person at the Admissions and Records Offices on campus. If you no longer have access to your PASSPORT account, please complete the Unofficial Transcript Request Form. Once completed, you may email/fax/mail the form to our office along with a copy of your valid government-issued ID. Unofficial transcript processing may take up to 1-2 business days. For records prior to 1970, please allow up to 5-7 days for processing. ***You are required to clear all financial obligations due to the college(s) and any other transcript “holds” in order to see/obtain a copy of your unofficial transcript. How do I request/order Official Transcript ? There are three ways you can order an Official Transcript. However, the quickest and most convenient way to request a transcript is online. Please go to Official Transcript Request for more information on Official Transcripts Order requests. I have already transferred from Peralta Colleges, and my current new school doesn’t have my IGETC. How do I get that to my school? You can submit your IGETC Certification request via email. Simply go to www.peralta.edu and click on Admissions and Records under navigation. From the selection of forms, look for IGETC and GE Breadth Certification Request. If sending by fax, complete the form and fax directly to, 510-466-7394. The form can be submitted in person to any of the Peralta Community College District-Admissions and Records offices. How do I change my status from non-resident to resident ? You will need to complete the Residency Questionnaire and submit it to the admissions office on campus with your supporting documentation. http://web.peralta.edu/admissions/admissions-records-forms/. Please contact residency@peralta.edu for more information and further assistance. How do I change my residency status from OTHER TO F-1? You will first need to contact the PCCD office of International Education for information. What are non-resident tuition fees? Non-Resident Tuition – $230.00 per semester unit California Community College Enrollment Fee – $46.00 per semester unit Capital Outlay Fee – $6.00 per unit; not to exceed $144 in an academic year Total per unit = $282. Will students still have a specific enrollment appointment time and will they be able to see when the appointment time is? Yes. Continuing students will have specific appoint times while new students will have access during open enrollment. This information is displayed on the Student Home Page of the PASSPORT system. New and returning students will be able to register during open enrollment. How does a student retrieve their User ID/Password? After you have completed the application process, or if you are a continuing student and have forgotten your User ID and/or Password, you will need to click the Activate/Reset My Account link in the Passport Student Administration System to retrieve your password by entering your SSN/Campus ID & Date of Birth. What is the turnaround time for receiving information after submitting an application? Students are advised to allow 24 to 48 hours after the submission of the application. Will an email or letter be generated and sent to the student after the application has been submitted?